Another month or so has come and gone and it has been busy. I am still a month behind on everything and its finally slowed down enough that I have a few days to play catch-up and get some R & R in. 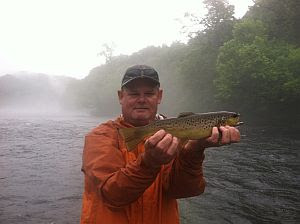 The Hiwassee River has been on all summer long with the dry fly bite being the main attraction. All I can say is that its been one of the best years we have seen in a long time. The water temps have hung in there for the third year in a row. Its amazing what a difference its made not having the pump back generator working at Hiwassee Dam. 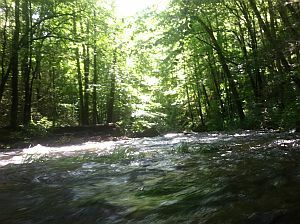 Even with all the spilling and constant high water flows that we have had this year the water temps are still good. I was on the water this past Sunday, Sept. 16th and I recorded a 67 temp just below the boat ramp, and 68 down around big bend. Now that's not anything to brag about, but we are mid September and the nights are cool, its not to hot during the day, & October is basically here. The water temps will start to drop back down in the low 60's high 50's before we know it and it will be game on for the fall and winter fishing. The Tennessee Wildlife Resource Agency Implemented a Delayed Harvest (D.H.) program on the Appalachia tailwater section of the Hiwassee River during the 2011-2012 seasons. This is the first D.H. on a tailwater river in the state. The 2013-2014 season will be third year of the program and anglers from across Tennessee should be keeping an eye on this one. Throughout the last two years the river has been full of fish year round. We have been consistently catching fish in the 12 -16 inch range throughout this summer with some larger ones being mixed in here and there. Like the last two years the water temperatures have stayed cold all summer and we should have plenty of hold overs as well as freshly stocked fish to kick off the D.H. season. 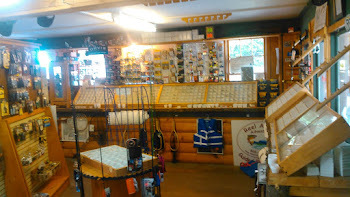 We have the fish; we just need the bugs to keep on coming and its game on for the fall fishing. With the hatches this year being the best I can remember in about ten years. The majority of our trips are heavily focused on dry fly fishing. There were a lot of days where we started out fishing dry droppers and switch over to straight dry fly’s once the top water bite would get hot in the afternoon. Let’s look forward into fall and early winter time of the year, while being a little optimistic. If the October Caddis will come on strong this year and the rest of the bugs keep on popping as well, then we should have some phenomenal dry fly fishing throughout the fall and well into the winter months. The Hiwassee has continued to exceed our expectations all year long and if the trend continues then the next year or two should get really interesting. On another note, earlier this summer I had a couple anglers catch some brook trout while we were fishing, I sent a note and a photo to the TWRA just to let them know of what we were seeing on the water. According to the TWRA response that I received, it was stated that, “there were a few mixed in with a load of rainbows from the Dale Hollow facility and that we could probably look forward to seeing some more when October rolls around”. 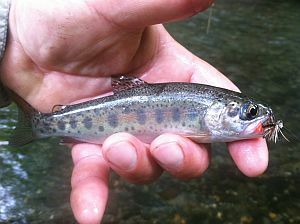 This will be the first time that I can think of that I have ever heard of Brook Trout being stocked on a the Hiwassee. I think that most anglers will enjoy the novelty of catching some brookies and that there addition to the river will be well received. If these stockings do take place anglers on the Hiwassee will now have the opportunity to catch a “Slam” or “trifecta” while on the river. 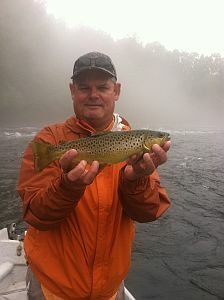 The Hiwassee can be fished both on foot and by boat with the 2nd option being my preferred method. The “Wass” can be waded on both one and two generators, but anglers need to be familiar with the area they are fishing in and exercise plenty of caution while wading on high water. The river can be wade fished very easily on a one generator flow as anglers will have a wide variety of places to choose from for wading opportunities. Now wade fishing on two generators is a little more difficult and there are fewer places on the river where anglers can wade safely. 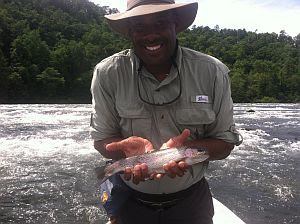 I do like to fish the river on low water flows, but over the past dozen years or so of fishing this river,” i personally think that the Hiwassee fishes better with a high water release schedule. Southeastern Anglers uses McKenzie style drift boats to float fish on the river. This is by far our preferred method to work with people on the water. This style of boat allows us to carry anglers anywhere on the river with all of the comforts and amenities of a mobile fly shop. 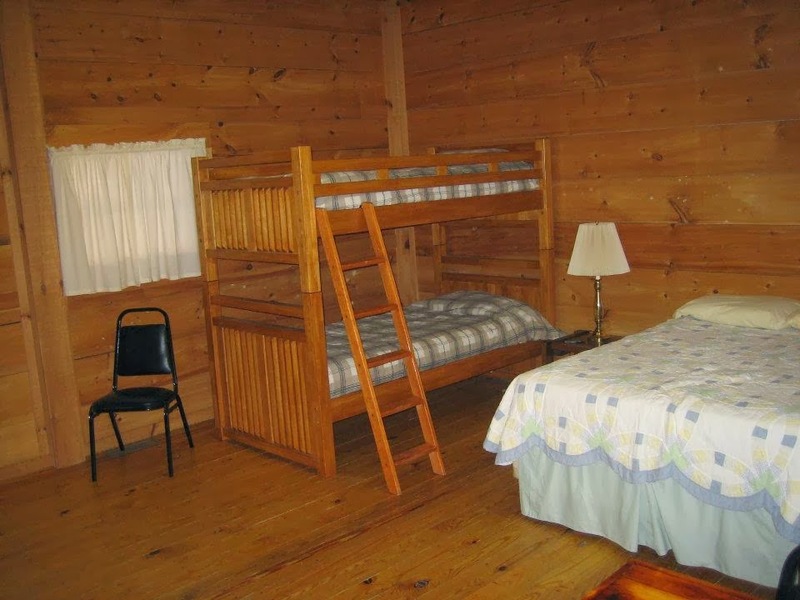 We offer float trips as long as we have at least a one generator release throughout the day. The river fishes very well on both a one and two generator flow schedule. I will say that, “The river fishes better on a one generator flow schedule from the top all the way down”. For up to date fishing reports for the Hiwassee River please go to the following websites or call for more information. The Hiwassee is continuing to exceed our expectations this year. It just seems to get a little better every month. July had a few surprised for us with the TVA running the river at 8000cfs for a week or so then lowering it to a fluffy 5000cfs for a bit longer. The normal flow for the Hiwassee River is 2800cfs, so it’s fair to say we were a little apprehensive about the fishing with the water levels being up. The river did not let us down, with 5000cfs flowing high and clear we had some phenomenal days on the water. The River is now at a normal 2 generator flow and the river is on fire. Water temperature is running right at 61 degrees and the fish are happy. 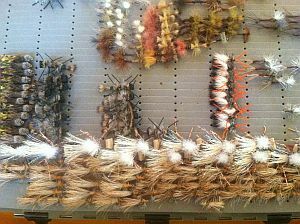 My preference for fly selection lately has been leaning more towards the western style of hopper dropper type rigging. I am using size 8 and 10 hoppers and attractor patterns finished off with a fairly large nymph as well. Pheasant tails, princes, tellico’s, lightning bug, zug bugs, and perpetrators are all working well. Generally I tell people to fish what they have confidence in, but it never hurts to throw in a little variety every now and then. I recently spent a couple of days up on the North River in the Tellico watershed as it was on a day when the main Tellico River itself was closed for stocking. The water level was still high from the recent rains and the water temperature was 60 degrees several miles up. We were able to take fish in a variety of ways with nymphs being more productive in the heavier water runs and pools. Dry fly fishing was our preference for the day so we spent more time floating dry flies over the glides and back eddies. The fish were more than cooperative as we were able to pick up around 20 or so while we were on the water. Elk hair caddis and small attractor patterns like stimulators and trudes worked well for the dry fly fishing. As far as nymph patterns went smaller pheasant tails, hairs ears, princes, & copper johns all produced fish. Anglers should note that the main stem of the Tellico itself is still closed to fishing on Thursdays and Fridays for stocking. Anglers must also have a daily Tellico / Citico permit in addition to their regular fishing license and trout stamp. There are times when anglers find themselves on the water wanting to fish dry flies, but there is no hatch or any sign of life on top. There are some among us that will fish dry flies no matter what; these are the purist as they will fondly refer to themselves. Stubborn is more often descriptive term that will be used by their fishing partners. Why would someone want to fish dries when they can easily take fish with other tactics? Yes, we could easily throw out a Pheasant tail and stick some fish; wouldn’t you rather see the fish take on top water if you really had the choice? For me it’s the satisfaction of knowing that I made the fish rise. Watching the take, seeing it all happen right there in front of me. Every fish will rise a little differently; it’s like seeing a little bit of their personality come out. Some rise fast and are hard chargers with no brakes at all. Others will have that slow, steady confident rise with no hurry; they just slowly come up and eat. Then there are the refusals. On some days well it’s just part of the game. There are two main kinds of refusals that I see on a regular basis. The fish rises and just stops right under they fly and goes into hover mode for a couple of seconds, then slowly swims back down. The second is a quick rise and a slash at the fly and turns off as quick as he came up. It looks like the fish wants to eat it, but something’s just not quite right. So what do you then if you really want a shot at some fish on dries when nothing seems to happening on top? There are a several courses of action that can be taken here and all of us have probably tried them all at one point in time or another. Every angler has a go to favorite that they will fish when nothing seems to happening. This is a fly that they have confidence in and have had some success with in the past. This is usually the first plan of action that most of us will go with. For many anglers I would say that depending on the type of water they fish these flies can be narrowed down fairly quickly. On our regions small freestone streams an Elk Hair Caddis & Adams are probably the top two on the list for many. For some of our tail waters a blue wing olive or a midge pattern may be the fly of choice. It all depends on the type of water being fished and the individual angler, me I like big attractor patterns. There are certain flies that are tied to match a hatch and then there are those that just look tasty to hungry trout. These attractor dry flies would fall into that second category. Often called prospecting flies, these fly patterns work in situations where you don't know what fly to try or when fish seem to just want to eat something buggy looking. Attractor’s patterns can fall into all types of fly construction, nymphs, streamers, wets, and dries. For me when I think of attractors I think of big bushy dry flies. These flies come in all shapes and sizes from a 16 to a size 8. The more common ones that most people are familiar with are the classic patterns like the H&L variants, irresistibles, humpy’s, stimulators, trudes, Madam X’s, & tarantulas. 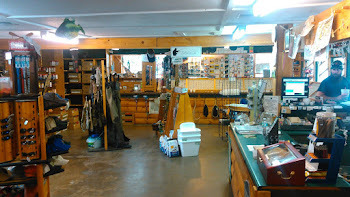 I am sure there are more out there as every year the fly tying manufactures are always trying to come up with the latest and greatest new patterns. In all honesty though even if you only carry a few of each of the patterns listed above then you will probably have your basis covered from the Smokies to the TVA tail waters. I like to fish my attractor patterns a couple of ways. Usually if I am on a small stream like the Tellico, North, or Bald Rivers I will fish them as a single dry fly and do just fine. This is generally a smaller size around a 16 or a 14. When on a larger tail water like the Hiwassee or the Toccoa Rivers I have a preference for a bigger size like a 10 or an 8. When I am fishing the larger sizes I go for double duty and drop off the preferred nymph of the day. This way I can work a dry fly drift as well as doing a little light nymphing. As far as the dropper is concerned that’s all up to preference as well. A general rule of thumb seems to be around 15 inches or so. On some water I like to drop a nymph back around 2-3 ft. so it can get down just a little deeper in heavier water flows. Usually I find that I will take as many fish on the nymph as I do the dry and I fine with that. I know its not the purist way, but oh well I’m not fishing with bamboo rod or wearing a tweed jacket or hat. 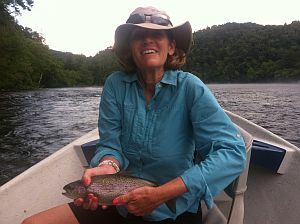 Fishing the Isonychia Bicolor hatch on the Hiwassee River. 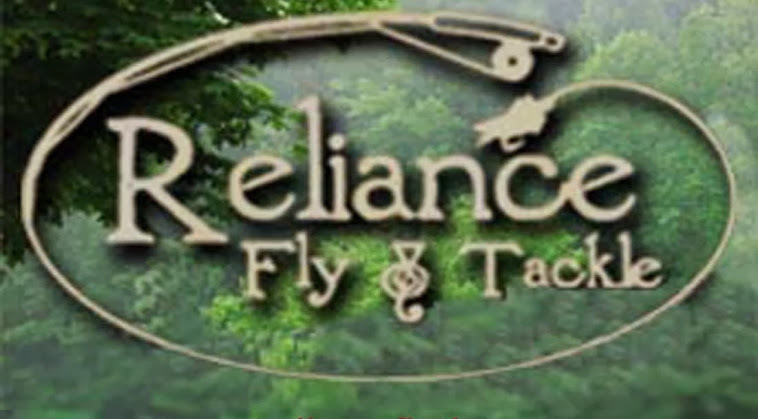 Summer is here and the majority of the mayfly hatches have come and gone, but on the Hiwassee River in Southeast Tennessee it’s the time of year for some serious dry fly fishing. 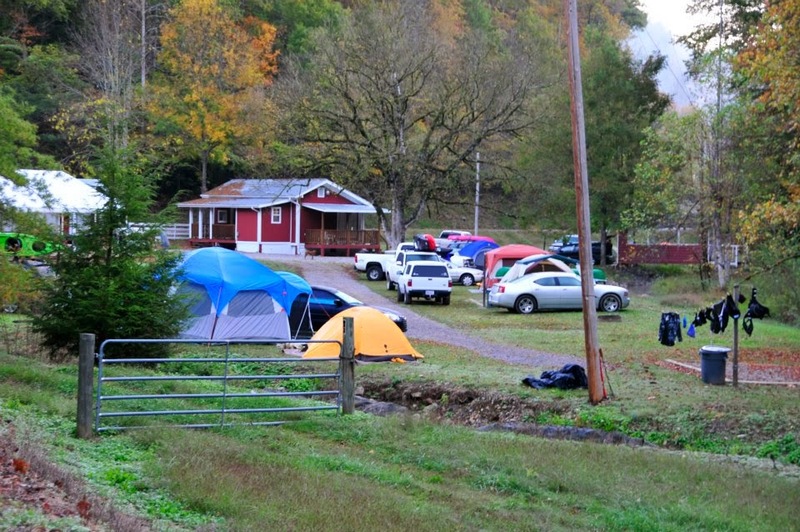 The Isonychia hatch is probably the most anticipated hatch of the year for anglers that come to fish on the Hiwassee. Isonychia’s are part of the mayfly order Ephemeroptera, Family Isonychiidae, and Genus Isonychia. Depending on location anglers may here a few different names other than Isonychia, some of the more common names are slate drakes and mahogany duns. The hatch is not usually heavy, but by all means it can be at times. The “Iso’s” will start showing up in mid to late June on the Hiwassee and will continue on through July and possibly later in some years. Once the fish key in on these big fly’s floating on the surface the game is on and the dry fly fishing is top shelf. The Isonychia bicolor does not happen on many rivers in the southeast and the Hiwassee is the only TVA tail water that is home a large population. The hatch will usually be more of an afternoon to evening event and can sometimes peak just before dark. On the Hiwassee we usually see sporadic widespread hatches throughout the day with a higher concentration of bugs in the afternoon. Some anglers may not always notice the Isonychia's hatching and on some days they may not see any at all. 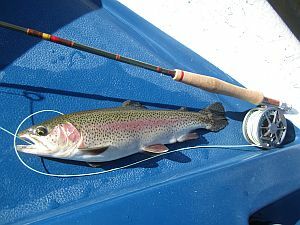 Do not let this discourage you, once the trout know that the Iso’s are here they keep an eye out for these bugs. Think of the Isonychia like a big trout steak. Even if there is not an active hatch happening, it’s on the menu and they will eat them. Just remember, it’s all about the drift, presentation can make or break your day. If you are mending poorly and letting your fly drag and swing around then your success will be limited. Don’t waste a good cast by not managing the drift. On the Hiwassee mending and drift management is important. The water is not glassy smooth, there are plenty of waves that will swamp your fly, back eddies that will pull on the line and put drag on the fly. If you are willing to work for the drift then you will have a better day. Besides, it’s fun to watch a plan come together. Especially when you put forth the effort and make it happen. The Tennessee Valley Authority has announced that it will help with funding for the next 3 years! This piece is a little longer than i would like to post, but if you would like to read it please use the link below to find the news release. The title says it all, the Hiwassee River is on FIRE!!! The summer rec flow is almost here, but tithe he abundance of water in the reservoir TVA has been operating at a two turbine capacity for a while now. The bugs are out and the fish are looking up. We have Caddis, Blue wings, & Sulphurs all hatching on the river right now. I worked a guide trip on the river yesterday with a single angler in my boat, Bart Turner from Birmingham, Alabama. 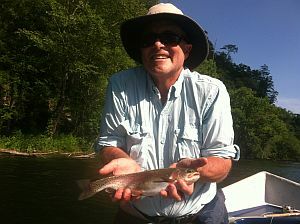 Mr. Turner caught fish on nymph rigs, streamers, sulphur dry flys, & assorted other dry fly patterns throughout the day. I think there was at least 30 fish taken on dry flys alone and we probably had a fish count of somewhere around 60 for the day. With that being a conservative number. Stop by the the shop and check out the board to get the hot flys that are working on the river. The Hiwassee Reservoir is at full pool for our summer recreational release schedule. The lake is currently at 1519.6 ft in elevation. With this level being at the top of the flood guide the Tennessee Valley Authority is operating the Appalachia powerhouse with some constant 2 turbine and 1 turbine flows. These types of water release schedules are perfect for our float trips here on the upper sections of the Hiwassee River. We have not had the reservoir reach this water level so early in several years. Anglers should be ready for some great fishing, especially if they like dry fly fishing. The Hendrickson hatch has been great this year and the sulphurs are starting to hatch now as well. This season has the potential to be one of the best in years. It looks like the Tennessee Valley Authority is getting ready to start spilling over Appalachia Dam. There is a predicted flow that is just over 5000 Cfs scheduled to start on may 8 th for the Hiwassee River. This is almost double the normal flow for the river, but it is still possible to catch fish at this water level. Just make sure that you are with a competent oarsman and be ready to put in a little extra work when needed. Just like our 1 generator water levels, these high water flows will separate the men from the boys. I am not sure how long this flow schedule will last, but as long as the water does not develop a bad stain it should fish like it always does. The water will be just a little higher.